As autumn descends upon us and we spend more time inside, what better time to take a long look at our hallways. The coats come out of the cupboard and inevitably end up on the bannisters or hallway chair. 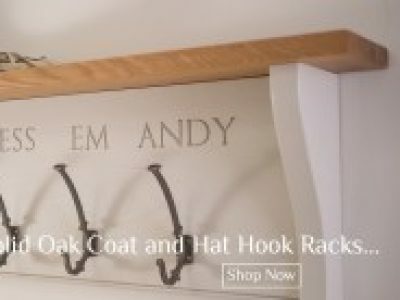 A great gift to encourage the family to organise their coats and hats is a beautiful handmade and hand painted Personalised Coat Rack by Peck & Chisel. How about engraving it with the family . 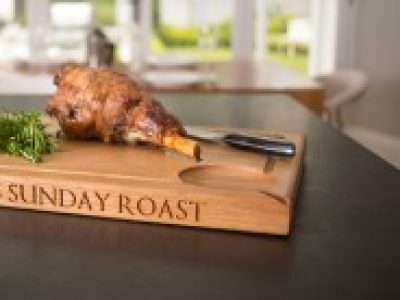 At Peck & Chisel we love our personalised chopping boards – after all, that is how we started – making beautiful handcrafted chopping boards for the luxury hotel industry. And we stay true to our abiding principals. Firstly, we source all of our wood from a local timber merchant, handpicking it from the wood yard to ensure that it is the finest piece. Then, our craftsmen hand-engrave each piece to ensure individuality and continuity . The last year has flown by. I can’t believe that only 11 months ago we were gearing up for our first ever Christmas Fair as a new business and it was the Country Living Xmas Fair that helped us have the most amazing year ever. We feel so privileged to have been chosen by hundreds of people at last years Christmas Fair to make their family heirlooms, gifts for wonderful friends and well as that extra special item, be it a personalised chopping board, or a walnut and copper trinket bowl for our happy customer’s homes. What is wonderful about being able to personalise our designs is that it can give that extra bit of meaning to the gift, showing that a great deal of care and attention was taking not only choosing the gift, but choosing us to make it for you. One of our themes this year has been a focus on healthy lifestyles. To that end we have perfected lots of new products, and increased the number of interior bike rack designs. We really love these. It allows cyclists to truly cherish their bicycles by hanging them in their homes, taking pride of place on the wall and turning their beloved two wheeled machine into a piece of wall art in its own right. Most of our sales have been into the urban market, mostly London and the surrounding areas. We just love the idea that after all that exercise, you can keep your bike safe in your home, off the floor and high on the wall perched on a well thought out and handmade bespoke bike rack. Our most popular wood has been walnut. I think it really accentuate the pared back aesthetic of urban style and works well with white or pale grey interiors. We have also delved into the world of the Foodie Board. 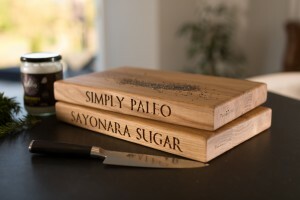 Our most popular ones this year have been the ‘Sayonara Sugar’ and ‘Purely Paleo’ pre-engraved chopping boards, helping to keep the healthy lifestyle-conscious of us on track. Made from Premium quality oak and pre-engraved with Wellness inspiration! Definitely our most rewarding time in the workshop is engraving for that special gift. This Father’s Day saw a flurry of orders for Bike Racks, personalised with words such as ‘Daddy’s Parking, ‘Daddy 2016’ and ‘Exercise Beast’. And Mother’s Day, ‘Mum’s on Fire’ and ‘Mum’s Time’. How wonderful!We have also made a host of different products as wedding gifts, not just the wonderfully engraved Wedding Chopping Board with date and names of the happy couple, but also Wooden Door Stops made for old Devon farmhouse beams, engraved with new house names and dates, and personalised Dog Lead Holders, for the couple that already have everything, including a dog! ‘Gin O’Clock mini Chopping Boards to India! Thank you Country Living – our beginning was with you and what a year we have had! And we look forward to this years Country Living Xmas Fair on 9th – 13th November 2016.